The session tonight (1/18/19) has been cancelled due to unforeseen circumstances. We apologise for any inconveniences caused. 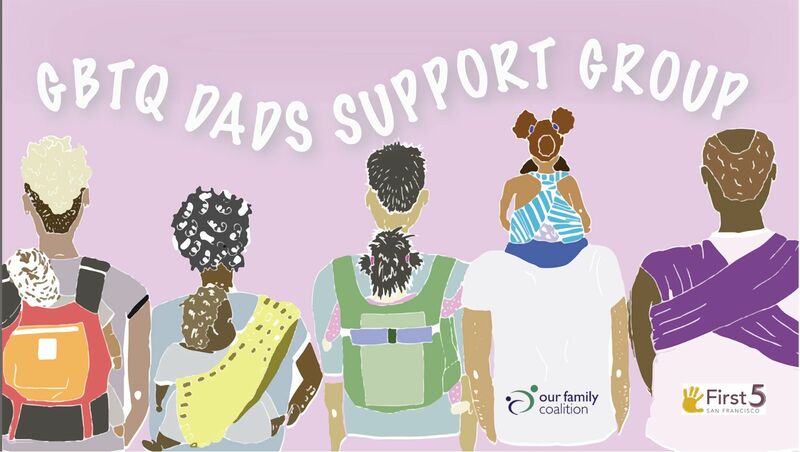 OFC's 8-week support group for gay, bisexual, trans and queer men with kids in San Francisco is a queer/trans-affirming space to connect with other dads, discuss parenting strategies, and share resources. Facilitated by Kellyn Lakhardt, LMFT. First-time participants will need to complete a brief intake upon arrival. Space is limited, so please commit to attending all sessions in the series if possible. Dinner and child care are provided FREE with advance registration at least 24 hours in advance. Dinner starts at 6:00pm and support group starts promptly at 6:30pm. Please register all family members who plan to attend, including any dietary restrictions as well as ages of children, so staff can make arrangements. Our office is within walking distance of Civic Center BART station and Van Ness Muni station. Free parking is available in Our Family Coalition's gated lot at the corner of 10th and Mission after 5:00pm; please call 415-981-1960 for access when you arrive. To enter the first floor lobby at 1385 Mission St, press #340 on the intercom to be buzzed inside, then proceed to Suite 340 on the third floor, accessible by elevator and stairs. For more information, please contact SF Programs Coordinator, Jeannette Page at jeannette@ourfamily.org or 415-981-1960 x309. We strive to make our programs accessible to all families. Please register for accommodations that would help your family participate to the fullest (e.g. Language interpretation, translated materials, childcare providers experienced with kids with disabilities, large print materials, allergen-free food options, etc.). If registering within 48 hours of the event, please call 415-981-1960 to ensure receipt of your request. This event is free for all attendees. Please consider making a financial donation to Our Family Coalition.